Traditionally a passionate devotee of Narayana, Deva Savarni’s son Vrishadhvaja turned out to to be a fanatic of Maha Deva to the extent of criticising Narayana. Surya Deva felt hurt not because of Vrishadhvaja’s devotion to Maha Deva but of the remarks against Narayana. Sun God cursed the devotee that he would be poor forthwith. This irritated Maha Deva and wished to punish Surya Deva, but Narayana pacified Maha Deva saying that the Trinity were of the same status after all. Maha Deva no doubt reconciled but desired to punish Vrishadvaja for his foul mouth. But Vrishadvaja died and so did his son Rathadvaja. The latter had two pious sons, Dharmadvaja and Kusadvaja who worshipped Maha Lakshmi and became Kings. Maha Lakshmi blessed Kusadhvaja with a pious daughter Kamala who became a yogini called Vedavati . While at her Tapasya, Ravana confronted Vedavati and made amorous approaches touching her hands. She became furious and cursed him that soon enough he and his family would be destroyed; thus saying she immolated herself in Yoga Fire. Eventually, Maha Vishnu and Lakshmi incarnated as Sri Rama and Sita and were destined to undergo on ‘Vanavasa’ (Forest Life), during which period Agni Deva in the form of a Brahmana informed that soon Ravana would plan to kidnap Sita Devi and desired that a fake Sita would be replaced by the original as advised by Devas and that this secret should not be made known even to Lakshmana. Thus the original Sita was protected by Agni and Ravana mistook the fake Devi all along. As Ravana died and Fake Sita was put to ‘Agni Pariksha’ (the FireTest), Agni Deva replaced the real Devi instead. Chhaya Sita was asked to practise Tapasya at Pushkara Tirtha and reappear in Dvapara Yuga as Draupadi in Dvapara Yuga. Thus Vedavati was known as Trihayani , the root cause of destroying Evil Doers in three Yugas. Devi Tulasi was the daughter of Dharmadvaja and she too turned out to be a Tapasvini, performing extremely severe sacrifices like meditation with ‘Panchagni’ or Fires on five sides of her body – on four direcions and on top. Lord Brahma knew her desire of wedding Narayana Himself. He explained to her that she was fully aware that She was a ‘Jatismara’ (person having knowledge of previous birth), that she was Devi Tulsi Gopi in her previous birth as a maid of Radha desirous to have union with Krishna in a ‘Rasakreeda’ (dance performance) which was not liked by Radha who cursed her to quit but Krishna advised her to take a fresh birth as the daughter of Dharmadhvaja as a Tapasvini. Brahma in turn explained to Tulsi that there was a Gopa (Cow boy) named Sudama who was of Krishna’s ‘Amsa’ (a part Extension) – also a ‘Jatismara’- as he too was cursed by Devi Radha to become a demon now called Sankhachooda. After marrying him, Brahma said that she would eventually attain union with Krishna as the latter would curse Tulsi to become a Sacred Tree to be prayed to all over the world. Brahma blessed Tulasi to become a Siddha to secure a good husband and also taught to her Radha Mantra, Radha Kavacha, Radha Stora and the method of Radha Worship to conquer her confidence and in the long run she would secure Krishna Himself. At the same time, Sankhachooda too got enamoured of Tulsi and, with the blessings of Brahma, married her in Gandharva style. But as the Demon tormented Devas and drove them away from their seats, they went in a deputation to Brahma and further on to Sankara who approached Maha Vishnu. But the latter explained that in his earlier birth the demon was Krishna’s Rasa Parishad Chief Attendant Sudama who was cursed by Devi Radha to become a Danava and as a Jatismara, he knew he had the Narayana Kavacha to protect himself, but Mahesvara could terminate him by a ‘Sula’weapon that would be provided by Himself (Vishnu) and that He also would spoil the chastity of the demon’s wife Tulsi, who too was a Gopi and again a Jatismari. Thus planned Maha Vishnu and asked Devas to get ready for the Deva-Danava War. Maheswara pitched His huge tent on the banks of River Chandrabhaga, sent an Emissary, Chitraratha, who was taken aback by the strength of the Danava King’s mammoth army of three koti (Crore) warriors surrounding the Danava King and another seven crore moving outside. The Emissary cautioned the Demon that besides Devas, Brahma and Maha Deva under the commandership of Skanda would all be on battle and the demon’s army would only be fodder to the killing sprees of the Devas side of the battle, more so since Vishnu Himself gifted a powerful ‘Sula’ to Mahesha to terminate the Danava King. ; as such it still would not be too late for the Danavas to withdraw to Patala. But the Demon King invited all the force to fight the next morning itself! In the hundred year long battle that followed, Devas and Danavas fought close- tooth to tooth and nail to nail; Mahendra pitted against Vrishaparva, Bhaskara to Viprachitti, Agni to Gokarna, Kubera to Kalakeya, Visvakarma to Maya, Yama to Samhara, Varuna to Vikumka, Budha to Dhritaprishtha, Sani and Raktaksha, Eleven Rudras to Eleven Bhayankaras and so on. The Danava King utilised a Shakti Arrow which made Kartika senseless and Bhadra Kali made such a roar which frightened thousands Danavas to death. Brahma used Brahmastra which proved ineffective. Siva desired to use ‘Pasupathastra’, but a Brahmana appeared and stopped its usage since that would destroy the whole world. Then the Brahmana (Maha Vishnu Himself) spread His Vishnu Maya and influenced Sankhachooda to part with his Narayana Kavacha and finally terminated the Danava King by the ‘Sula’ gifted by Narayana to Mahesvara. Meanwhile Vishnu Maya was spread again and Devi Tulasi was made to believe that the Danava King Sankachooda won the battle and Maha Vishnu assuming the form of the King was cheated as Tulsi welcomed him and got her chasitity spoilt simultaneously. But she got suspicious in their union and being afraid of a curse from her, revealed Himself. She was overcome by grief as her beloved husband lost his life and worse still her chastity was affected. Thus Tulsi cursed Vishnu to turn as a stone. Maha Vishnu consoled her and asked her to assume an extra-terrestrial form as His wife, as the entire drama was enacted by Himself and assured her that she would be His better half in Vaikuntha besides Maha Lakshmi and as a Tulsi Tree would bestow boons to her devotees in the entire Universe. Whatever happiness that He would receive from the ‘Abhisheka’(Mantra filled bathing) of Himself thousand times would be bestowed by offering a single leaf of Tulasi; that the benefit of giving away as offerings of several cows would be equated to an offer of a Tulsi leaf; if a dying person is administered a Tusi leaf , [preferably with Ganges Water], his access to heavens is assured; whoever drinks Tulasi leaf water daily gets the benefit of performing horse sacrifices; Plucked Tulasi leaf kept in the night in a house wards off evil spirits and bad dreams; decorating Tulasi leaves on a Deity is propitious and gifting items along with the leaves is considered as auspicious to the donor and the receiver alike. 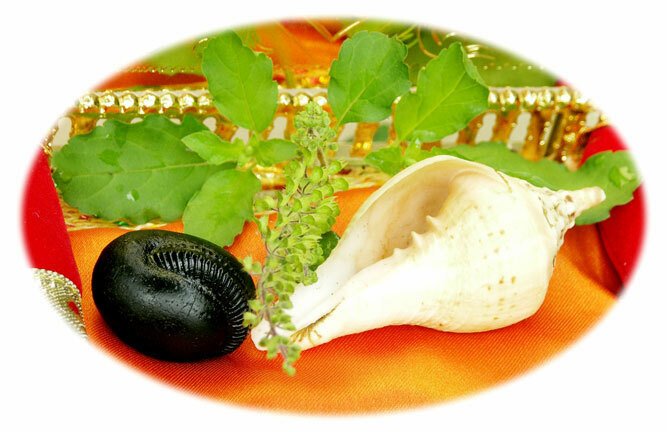 Contrarily, plucking Tulasi leaves in the nights, particularly on a full Moon or the twelfth day of a month (Pournami or Dvadasi), or twilight timings, mid-days, while applying oil, during impure days of ‘Asuchi’, or while donning dresses is strictly prohibited as it attracts great sins. Worship to Tulasi (Holi Basel) done with pure body and heart in a formal manner would certaily bring about excellent peace of mind and spiritual contentment. Any and every place of Her puja is a Brindavan or a Garden of several plants / trees. She is worshipped by the Eight names as Brinda, Brindavani, Visvapujita, Visvapavani, Tulasi, Pushpasara, Nandani and Krishnajivani. She is worshipped by the ten worded Seed Mantra: Srim Hrim Aim Kleem Brindavanai Svaha. As regards Tulasi’s curse to Vishnu to turn as a stone, the Lord consented to become a Stone or ‘Salagram’ worthy of performing worship as a Symbol of Vishnu and such special Stones are available on the banks of River Gandaki, whose Principal Deity is Tulasi Herself. Such Stones are natural formations of various sizes, forms, convolutions and ‘Chakras’(circular formations), embodying armoury or ornaments of the Lord and are kept at Puja Mandirs (Worship Places) of individual households for Daily and Regular Pujas or at Public Places of Devotion. But care must be taken that the Salagram, Conchshell and Tulasi leaves are placed and worshipped all together, lest separation of any of the three items is warned is considered as a great blunder, as it might yield negative results. Normally males perform the Salagrama Puja. Further, the Pujas ought to be performed with all purity and devotion with Vedic Mantras by way of milk ‘Abhishekas’, flowers, Tulsi leaves, lighting, Naivedyas and such other ‘Sevas’ (services). Since the Pujas are to be done daily and there should not be failures on that count, and if necessary, the person(s) could be different, but the Puja be performed on a regular basis.